Majority Of Youngest Migrants Reunited With Parents, Trump Administration Says Out of 103 children under 5, officials say that 57 have been returned to their parents and that the rest are ineligible. But it's up to a judge to decide whether they've complied with the court order. Demonstrators gathered last month outside a detention facility near El Paso, Texas, to protest the Trump administration's "zero-tolerance" immigration policy. On Thursday, two days after its original deadline, the Trump administration announced that it has complied with the first part of a court order to return the nearly 3,000 migrant children separated from their parents in recent months. 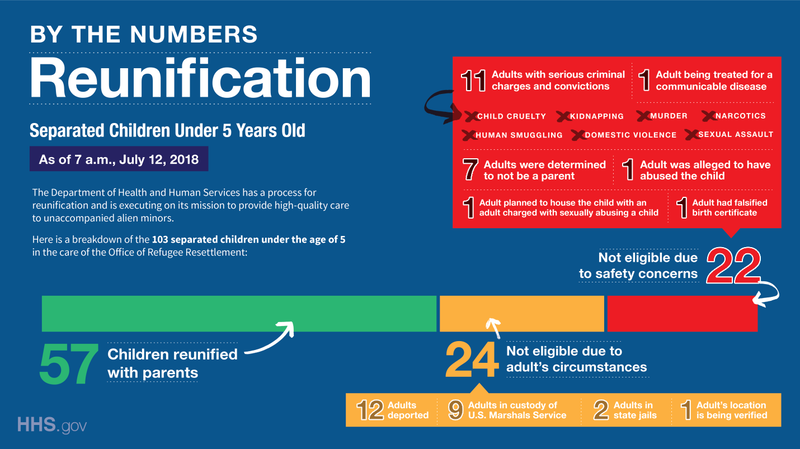 Administration officials had been under a mandate to reunite the youngest minors, or migrants under the age of 5, with their families by Tuesday — and by Thursday morning, they say they have reunited 57 of the 103 children who fit that criteria. Officials determined that the rest are ineligible for reunification for a variety of reasons, ranging from their parents' criminal records to the fact that some self-proclaimed parents were not their parents at all. "Throughout the reunification process, our goal has been the well-being of the children and returning them to a safe environment," said the heads of the three departments collaborating on compliance — Health and Human Services Secretary Alex Azar, Homeland Security Secretary Kirstjen Nielsen and Attorney General Jeff Sessions. "Of course, there remains a tremendous amount of hard work and similar obstacles facing our teams in reuniting the remaining families," they added in a joint statement. "The Trump administration does not approach this mission lightly, and we intend to continue our good faith efforts to reunify families." It remains to be seen whether the court will agree that the administration has properly complied with its order, however. Justice Department attorneys have been under a 6 p.m. ET Thursday deadline to explain to Dana Sabraw, the U.S. district judge behind the court order, how they returned the eligible children — and why the rest are ineligible for return under the court's guidelines. Sabraw had said earlier this week in court that he expected the government to be able to reunite at least 63 children with their parents by the end of Tuesday. The group that brought the lawsuit, the American Civil Liberties Union, expressed its own deep skepticism of the administration announcement. 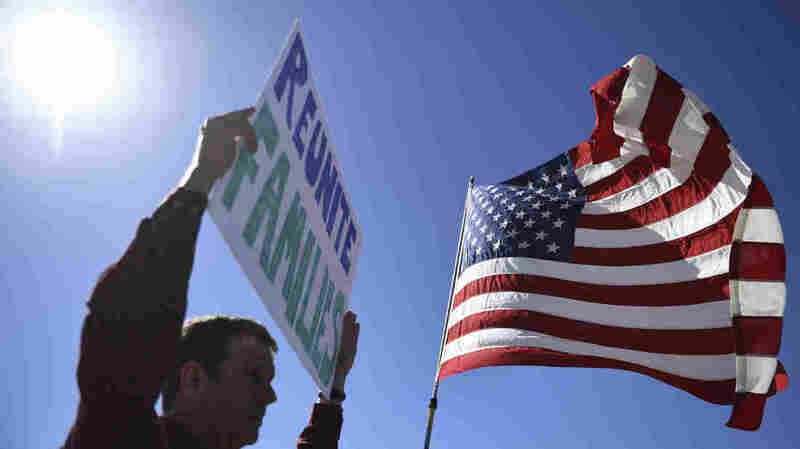 "If in fact 57 children have been reunited because of the lawsuit, we could not be more happy for those families," Lee Gelernt, deputy director of the ACLU Immigrants' Rights Project, said in a statement Thursday. "But make no mistake about it: The government missed the deadline even for these 57 children." In a federal filing submitted later in the day, the ACLU demanded more information as to why many children were not reunited with families. The group called for the government to "complete all parentage verifications and background checks," by July 19. "These steps, which must be completed prior to reunification, should already be in progress or completed," the filing said. "One week from today should be more than enough time to complete them." For other cases where the government determined that parents and children could not be reunited, the ACLU said a list of "any criminal convictions or charges; any allegations of abuse or unfitness; or the specific reasons why parentage could not be verified," should be provided. It also said that the government should "establish a fund to pay for professional mental health counseling, which will be used to treat children who are suffering from severe trauma as a result of their forcible separation from their parents." The battle lines between the government and civil liberties advocates have been drawn amid continued uncertainty over the number of young children who were separated and placed in federal custody during the implementation of Trump's "zero-tolerance" immigration policy. That total stood at 101 on Friday, according to officials, but crept upward in the following days, even as the ACLU suggested that there could be still more eligible names that officials are missing. But the principal point of contention is likely to be the matter of eligibility: How did federal officials decide that more than three dozen children cannot be safely returned to their parents at this time — and was that decision in line with the court's criteria? Nearly half of the children still separated from their families remain so because of "safety concerns" related to the individuals identified as their parents, according to the Department of Health and Human Services. Those concerns include charges or convictions for violent crimes. The agency says that others were found to have been falsely claiming status as the kids' parents and that about a dozen other individuals have already been deported, some of whom "chose to leave their children behind," notes Albence. U.S. authorities are "under no obligation to bring [deported adults] back for reunification," he added. "If they want their children to return to them," working with a consul will "help facilitate that. We don't have the legal authority to bring those people back into the country. They have no lawful right to be here." Amid the disputes over this week's deadline, another larger one looms in the weeks to come. In the same order addressing the youngest migrant children, Sabraw also mandated that children aged 5 through 17 — the rest of the nearly 3,000, in other words — must be returned to their parents by July 26. Officials are expected on Thursday to explain how they plan to do so.